I've finally finished the guts of the amplifiers and powered them up for the first time. The job took far longer than I ever expected, mostly because I only had a few hours each week to spend on it. The metalwork was much more involved than an amateur like me ever expected, and just rewinding the two mains transformers took me over three months. The input circuits and the monitoring and protection circuits were a pain to get right, too. In my preamplifier I mounted the signal handling board to the chassis through small rubber grommets to help isolate the board from external vibration, mostly from the mains transformers. I did the same with the PCBs for this amplifier - mainly again to reduce transfer of vibrations to the possibly sensitive components on the board, but also to help relieve the stresses on the power transistor leads when mounted on the heatsinks. The small cluster of bits on the upper right of the heatsinks in the photos comprises the voltage regulators for the 55V supplies. I built these on the heatsinks partly to give some thermal protection to the regulators and pass transistors, and partly because there was nowhere else to put them. Mains transformers. I originally intended to have a separate toroidal transformer for each channel, but soon realised that it would have been a very tight fit inside the chassis. I therefore had to wind four 35V secondaries with 1.5mm wire and four 45V windings with 0.9mm wire on each core, which meant that there was only just enough room to get an 8mm bolt through the middle of each toroid! 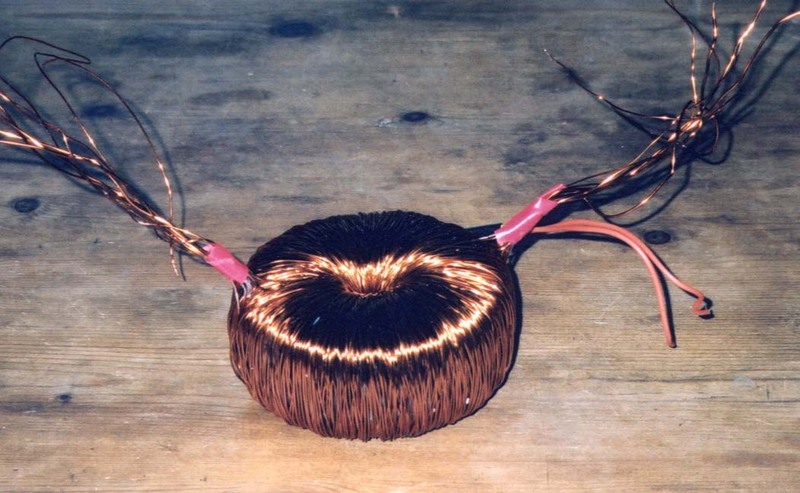 To protect the windings and reduce mechanical noise, I finished each transformer off by wrapping the outside with insulating tape and then sealing the top and bottom with Maplin's potting compound. The extra windings also meant that the bolts that came with the transformers were now too small to go all the way through, so I potted in the bolt heads too, which gives quite a smart appearance. The transformers are still a pretty snug fit in the boxes. In use there is still a small hum from the transformers, which is almost inaudible even at close range with the lids on the amplifiers. Thermal monitoring. Since each amplifier channel has two heatsinks with two MOSFETs on each, I realised that I couldn't rely on a single thermistor per channel to detect a fault condition. I therefore decided to put a thermistor on each heatsink, and use four of Maplin's Temperature Protection circuits, each feeding the Amplifier Protection Module. For more compact use of space on the front panel board, I rebuilt the temperature detector circuits (just an LM311 comparator with hysteresis) around an LM393 quad comparator IC. The thermistors are mounted with the bead in a 5mm hole in the heatsink (with plenty of silicone grease) and a bolt and nylon washer to hold the leads in place. MOSFET matching. I did this following Nelson Pass's article, using the circuit shown opposite, with a current of about 120mA. 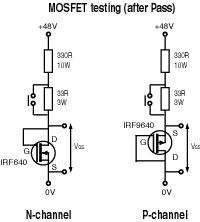 I managed to get a set of eight MOSFETs of each polarity with VGS within 0.04V of 3.5V for the IRF640s, and within 0.04V of 3.7V for the IRF9640s, then selected pairs with the closest values; the discrepancy between each pair was less than 0.02V. Nelson Pass also suggests measuring dVGS/dID by changing the current in this test, so I included the switches to increase the resistance by 10% (and decrease ID by a similar proportion). I found that the resulting change in VGS was only 0.02V or so for all of the MOSFETS, so wan't resolvable by my DVM on its 20V range. Since the MOSFETs all lay within a narrow band of VGS and the dVGS/dID was at least consistent between all the transistors, I disregarded the latter. 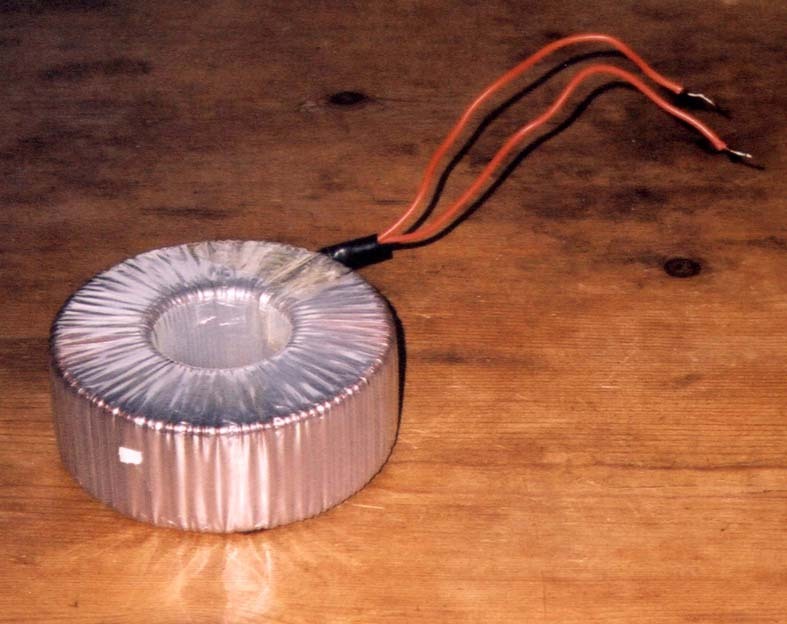 Despite this, once the MOSFETs were on the PCBs I found that IQ varied by 50% or more within pairs, which is on the borderline of acceptability. Since I had matched them almost to the precision I could measure them to, I guess the only practical way to get better matching would be to increase the value of the source resistors from the 0.33 ohms of the final EW article to 0.47 ohms or so. In the end I reduced the standing current to 100-120mA (35-40mV typical voltage drop across the source resistors), since the IQ of 150mA specified in the final Stochino article made the heatsinks just too hot to touch after half an hour or so. Switch-on thumps. Since the Stochino circuit is in principle exactly symmetrical, I had naively assumed that the transients on switch-on and off would be negligible. In reality I found that the amplifier produced impulses of up to 10V at power-up as well as down. As a result I've reluctantly added output relays to mute the output until the amplifier is stable. System standby control. My new system is intended from the start to be used as a system, with the preamp sending a "standby" signal to the other components so that separate on-off switches are not required. The phono stage and active crossover are designed to be powered up constantly, since they don't consume much power, so the standby signal just switches the front panel displays off. However, the power amps do get quite warm, so I added a relay which simply reverses the state of the on-off switch on the front panel when the standby input is low. This means that so the power amps can be used either standalone or as part of the system (once I've finished the preamp). The crucial question - How does it sound? 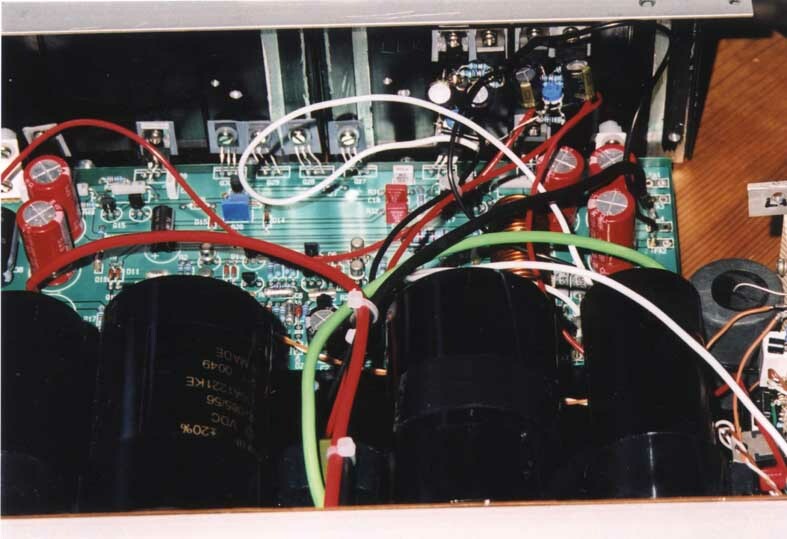 When I connected up the first of my two amps to my system (this consisted of my passive preamp and ProAc Studio Ones, my new preamp being incomplete and my active speakers mothballed until I finished this project), I was a little disappointed. 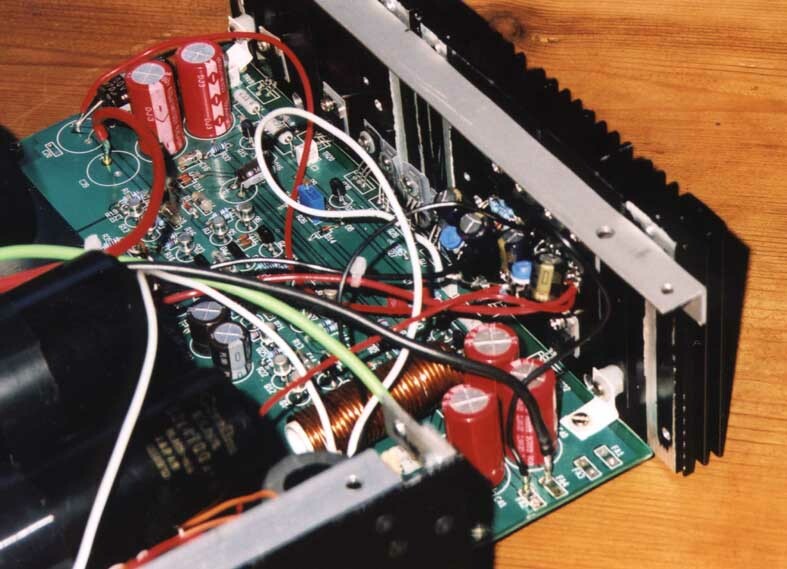 The amplifier sounded powerful and didn't give any impression that it was even close to running out of steam, but I didn't hear the clarity I was expecting, and there was a slight harshness when I turned the volume up, even after an hour or so when the heatsinks were nice and toasty. Overall there was a blandness and sameness to the sound, which made listening even at moderate volumes rather boring. After a day or two, however, the amp was definitely starting to run in and sounded much more open and authoritative than the modified Maplin 150W monoblocs that it had replaced. I've never understood how electronics can "run in" - what is the physical process involved? I know I'd been looking forward to hear these amps ever since I started planning them more than two years ago, and I wasn't exactly relaxed when I plugged the speakers into them for the first time, but it can't be just a psychological effect. All the same, I've noticed it many times, and it definitely happened here. My wife certainly complained after the first half hour that the music was giving her a headache, but after a few days was keen to find out how to switch them on and off herself, and indeed told me "this is the best your system has ever sounded"! I certainly don't find the sound fatiguing any more, except when the recording is at fault. If anything, there is a certain "darkness" about the sound, and a lack of "sparkle", which reminds me a little of the Exposure integrated I owned many years ago. I wonder whether this is related to the lack of high-frequency nasties, or perhaps the result of that ridiculously low input impedance (4.7 kilohms) loading down the passive preamp and maybe even the source components. I look forward to hearing the amps with an active preamp. One of the most impressive strengths of the Croft 5 valve amplifiers that I was using until a year or so ago was their transparency. My favourite test for this is to play one of the free cover CDs from Gramophone Magazine, which contain a wide range of recordings dating from (mostly) high-quality modern recordings back to the 1930s, and with the Crofts I could clearly hear the change in acoustic and instrument placement from track to track. I find that this is a subtle but crucial test of amplifiers, as many fail it, and in most cases it seems to be the fault of the amplifier at least as much as that of the source or loudspeakers. I've never been impressed by the performance of any of the solid-state amps I've owned in this respect, and even the Stochinos don't quite manage this trick as well as the Crofts, although they do the job better than most. Another aspect of transparency is the ability to differentiate different instruments. For instance, different makes of piano sound very different in real life, but this isn't obvious through most hi-fi systems. A second example is the timbre of a viola, which is very different from a violin when heard "live". This is something that valve amplifiers again are typically very good at, and I'm very pleased with the way the Stochinos do it, even through the relatively modest ProAcs. One subjective aspect of these amplifiers which I'm very pleased with is the bass. This is definitely the most solid and tuneful, and least muddy, bass that I've ever heard in my system, even through the ProAc Studio Ones (which aren't exactly lean in the bass). For the first time I can hear clear and consistent differences between CD and LP in the bass. One of the reasons I bought my Pink Triangle PT TOO all those years ago was that it didn't sound "wrong" next to CD, unlike many other record decks which sound bloated in the upper bass (I won't name the Glasgow-built deck that was the worst offender...). However one may feel about the other attributes of the CD medium, it's impossible to deny that when implemented properly it has a superbly flat frequency response and a very stable and extended bass, and these are (for me at any rate) the hardest things to get right with vinyl. My system is now transparent enough to suggest that my vinyl front end needs tuning, and may indeed be limiting the low frequency performance, as it definitely shows some loss of definition and solidity next to CD. How much of this is due to the Pink and how much to the arm and cartridge (SME Series IV and Ortofon MC30 Supreme) - or even to the vintage of many of my LPs - is hard to know without direct substitution. A few weeks after I wrote the last paragraph, I realise that things are not quite as they seemed, and that my record-playing setup is better than I thought. In the last week I have listened to Neil Young's "Harvest" and Zubin Mehta's 1969 recording of Schoenberg's Variations - both discs which might lead one to suppose that the vinyl front end is adding some substantial surplus weight to the upper bass. However, I also played Salif Keita's "Amen" and a digitally-remastered release of Frank Zappa's "You Are What You Is", and both sound almost like CD recordings - a very tight, solid bass and plenty of superficial detail, but with the sound apparently focused onto the line between the speakers, and with very little depth and reduced separation and presence of the performers. I am becoming more and more convinced by the method of "comparison by contrast", in which a superior system is defined by its ability to reveal differences between recordings. I think my own system is becoming progressively more discriminating between the LP recordings I have, and certainly shows the superiority of the black disc over CD in this respect. I just hope that I can stay on this path without too many of my favourite recordings becoming unlistenable! An interesting observation is that vinyl surface noise seems to be significantly quieter with this amp than with the Maplin 150W. I wonder whether this is a consequence of the hugely increased slew rate (300 V/us compared with something like 10 V/us). It's just a supposition, but the speed of the amp may well be ensuring that short transients don't confuse the feedback loop. At this stage the amps are still improving and I'm still working on them, finishing off the aesthetics, upgrading wires and connections and adding the housekeeping functions. I'm looking forward very much to hearing these amplifiers with my active speakers, which should provide a much wider window.